Soap Magic Dispenser! এই সোপ ডিস্পেন্সারে তরল সাবান বা শ্যাম্পু রেখে ব্যবহার করার সময় জাস্ট নিচে হাত দিলেই অটোমেটিক ভাবে পরবে-SOAP MAGIC-hands-free Motion Activated Soap/Sanitize Dispenser! 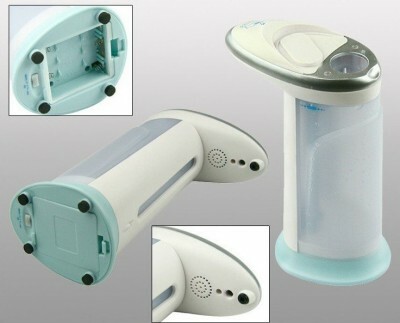 Features: Pop-up lid for easy refills, Built-in infrared smart sensor, Fully automatic and completely touch-free operation, Three settings allow you to dispense different amounts of soap, No-drip innovation eliminates both waste and counter top messes, LED indicator inside the translucent tank illuminates with soothing mood light, when dispensing, Low battery alert by flashing the light intermittently, Smart looking and elegant compact design, Clear window shows fill level, Works with all kinds of liquid soaps, dish-wash liquids, body lotions, shampoos, hand sanitisers! Technical specifications: Power: 4xAAA-1.5V Batteries-(not included), Product Size: 12.5x19x6cm.